North Rose-Wolcott Central School District recently recognized the academic achievements of high school students at an academic awards night. “We are so proud of these students for showing grit and determination both in and out of the classroom,” said NRW High School Principal Brian Read. Each class walked on stage to receive honor and high honor awards. Scholarships were distributed to senior students planning to continue on to higher education. The President’s Award for Educational Excellence went to Taylor LaValley, Triniti Boykin, Kalen Bjerga, Alexis Perkins, Nicole D’Aurizio, Kelsie Fischette, Bay Batzold, Jacob Snyder and Kylee Mendat. High Honor and Principal’s Honor Roll Award went to Triniti Boykin, Nicole D’Aurizio, Alexis Perkins, Jacob Snyder and Taylor LaValley (Principal’s). 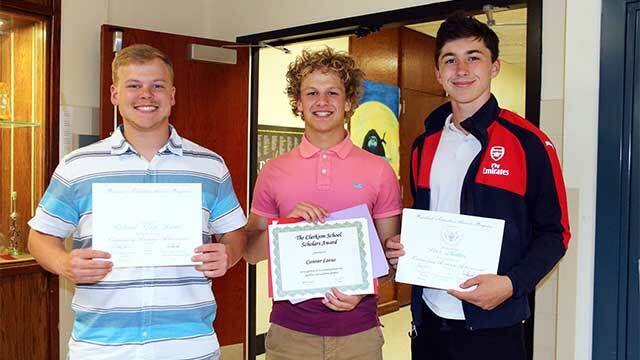 North Rose-Wolcott High School students Richard Gage Leous, Connor Leous and Peter Mattice smile with awards they received at the annual academic award ceremony. The following awards were also distributed: The Pastor Dan Corretore Scholarship (Abigail Loperfido), the Keuka College George H. Ball Community Achievement Award (Emily Graham, Sierra Perkins, Samanta Osorio-Ortiz, Daisia Delpa and Kassidi Lake), the Clarkson Leadership Award (Chynna Plantz), the Clarkson University Achievement Award (Mason VanFleet), the Clarkson Scholars Award (Connor Leous), the RIT Innovation and Creativity Medal (Taylor Malchoff), the RIT Computing Medal (Drew Fowler and Shealyn Shattuck), the Rensselaer Medal for Math and Science (Connor Leous), the University of Rochester’s Bausch and Lomb Honorary Science Award (Phillip Ufholz), the University of Rochester’s George Eastman Young Leaders Award (Katherine Frazer), the University of Rochester’s Frederick Douglass & Susan B. Anthony Award (Emily Meyers), the University of Rochester Xerox Award for Innovation and Information Technology (Michael Statskey), the Wells College 21st Century Leadership Award (Shealyn Shattuck) and the Elmira College Key Award (Hannah Cook and Reece Morris). This year’s salutatorian is Triniti Boykin, and the valedictorian is Taylor LaValley.